Having studied at the Pennsylvania Academy of the Fine Arts and under the Impressionist William Merritt Chase in New York, Sheeler took up architectural photography in 1912 as a means of supporting his painting. As both painter and photographer he focused on the sense of structure and form of his subjects, whether they were still lifes, buildings, interiors, machinery, or industrial environments. 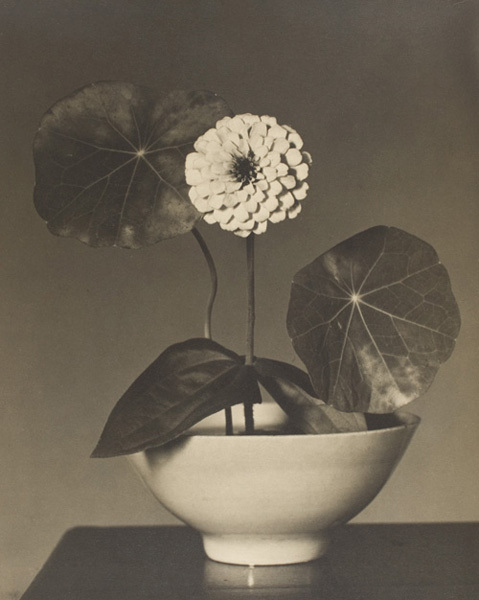 Zinnia and Nasturtium Leaves- one of eight photographs by Sheeler in the Museum's collection- emphasizes this structural character through the assertive forms of the stems, leaves, and flower, anchored by a round bowl. The artist, who took this matter-of-fact still life at a time when the soft-focus, idyllic imagery of pictorialism dominated American photography, once stated: "I have come to value photography more and more for those things which it alone can accomplish, rather than to discredit it for the things which can only be achieved through another medium."